Dr David Dobbin CBE, Chairman of the Northern Ireland Food and Drink Association, has called for the local agri-food industry to up its game right along the supply chain to take on the competition and seek out the best opportunities for increased value from the market. He said that the industry faced major challenges in the form of intense price competition and falling returns and that it could not afford to sit out the current difficult markets and wait for things to get better. 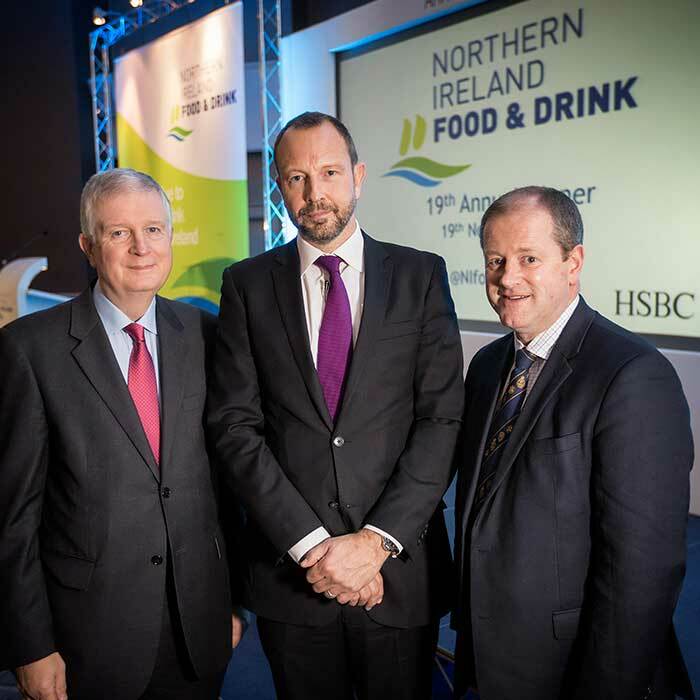 Dr Dobbin made the comments at the 19th Northern Ireland Food and Drink (NIFDA) Annual Dinner, sponsored by HSBC and attended by over 200 leading figures in the local agri-food industry. He said that whilst a number of factors are causing marketplace volatility and turmoil, food manufacturers and processors must focus on pro-actively pursuing opportunities rather than simply adopting a defensive position. Dr Dobbin said that the Northern Ireland agri-food industry must exploit its strengths, including our island status which is enabling us to create a ‘food fortress’ with one of the highest integrity supply chains in the world. He also welcomed the recent political agreement which includes a reduction in the rate of corporation tax to 12.5% by 2018, and the continuation of the industrial rate relief for manufacturing. NIFDA is due to issue its manifesto in early 2016, which will outline its main priorities for removing barriers to trade and improving the competitiveness of the sector. Dr Dobbin outlined the main themes of the manifesto – which include: reducing our cost and tax base; increasing market support activity; increasing product and process innovation activity; and improving our skills base and attracting talent in the sector. Tesco Plc Chief Product Officer Jason Tarry took to the podium on the evening to outline Tesco’s future plans in Northern Ireland, while local Tesco representative Cliff Kells, who is due to retire in 2016, was honoured at the event for his significant contribution to the local grocery sector. Pictured at the 19th Annual NIFDA Dinner are NIFDA Chair, Dr David Dobbin CBE; Tesco Chief Product Officer, Jason Tarry; and Head of Food and Agriculture UK for HSBC, Allan Wilkinson.